Alexander Walker was truly a remarkable man with a wide range of talents. Walker’s work however was much neglected in the past. It has however been revived recently by the Cape Breton Fiddlers and Paul Cranford. Cranford Publications specialises in Celtic fiddle music from Cape Breton, Ireland and Scotland. Proprietor Paul Cranford is a fiddler, composer and retired lightouse keeper well-grounded in the traditions of music he sells, performs and arranges. Paul was responsible for republishing Alexander Walker’s Collection in 1991. He is at present creating a digital version of the book which will be accompanied by historic backgrounds many of which are taken from this site. 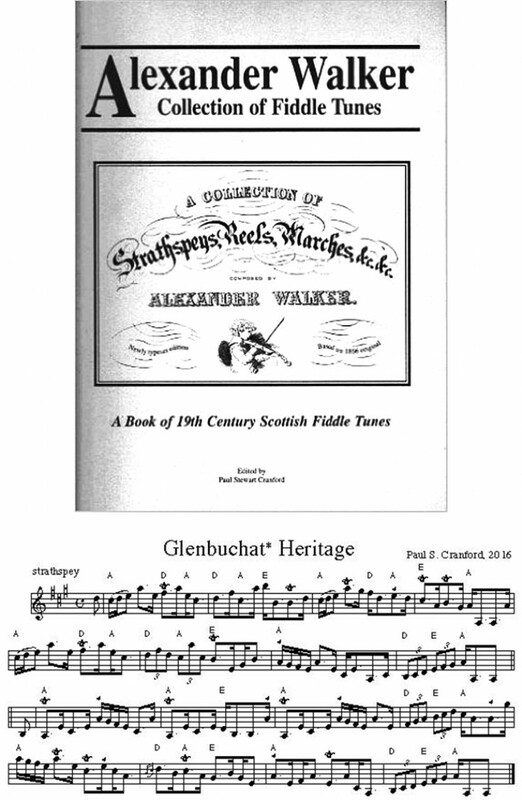 Paul has very generously written a fiddle tune for this site entitled ‘Glenbuchat Heritage’. The music is shown above.